“The rate of TV replacement varies, but on a global basis, the majority of households are still replacing CRT TVs with flat panel TVs,” noted Riddhi Patel, NPD DisplaySearch Research Director, Consumer Insights. Findings from the annual update to the NPD DisplaySearch Global TV Replacement Study indicate that, over the past year, the TV replacement cycle decreased on a global scale, from 8.4 to 6.9 years. The study found a variety of reasons for this trend, including declining prices, a wider variety of sizes, and desire for the latest technologies. The study analyzed the purchase intent of consumers across 14 different markets. The results indicate that in the next year, 31% of households are planning to replace an existing TV, while 22% are planning to add a new TV. The most critical driver of TV replacement in nearly all countries is a desire to trade up in size, followed by wanting to own a flat panel TV with improved picture quality. Although price was not among the top 3 reasons for recent replacements, the study indicates that it does have a significant impact on the purchasing decision. Thus, pricing can be a key driver in increasing flat panel TV penetration (by replacing CRTs) and shortening the replacement cycle (by replacing older flat panel sets). As TV prices fall and profit margins are compressed across the supply chain, the push to introduce new premium features has taken on increased importance. The hope is that these new features, such as 3D and internet connectivity, will drive consumers to replace TVs faster. However, the results from the NPD DisplaySearch Global TV Replacement Study suggest otherwise, as these new features were reported to be only somewhat important in selecting a new TV, and not a strong motivator to upgrade. “The good news is that a large number of markets still have a long way to go toward replacing all CRTs with flat panel TVs, which should continue to sustain growth, but mostly in emerging markets,” Patel added. Moving one’s household to a new location, once thought to be a strong driver of replacements, was found to be a very weak driver in all markets surveyed. Nine markets in the study have over 50% penetration of flat panel TVs. There are still five markets with 40% of households having only CRT sets. The average age of the primary TV in households ranges between 4 and 7 years, with India the highest at 6.7 years and China-Urban the lowest at 3.5 years. 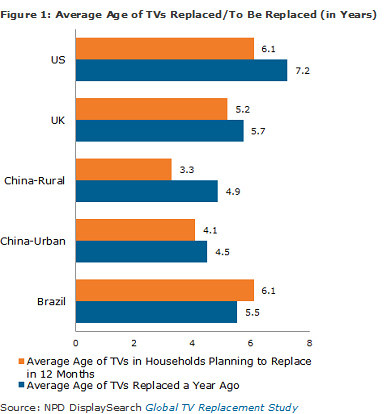 Households in emerging markets, such as Russia, Brazil, Mexico, and China, are much more likely to be planning to either replace or add TVs than in the US and European countries. Over 40% of households in China are planning to replace their first-generation flat panel TVs, similar to the rates found in mature markets. 32” continues to remain the most desired size in the majority of emerging markets, whereas 40-44” sizes dominate planned purchases in mature markets. Knowing when the flat panel adoption will slow down is very critical as the supply chain needs to understand when to make the necessary changes to their plans in order to avoid inventory glut. The NPD DisplaySearch Global TV Replacement Study offers a focused view of TV replacement trends in 14 global markets. This study also provides insight into the reasons why consumers are replacing their CRT and flat panel TVs. Reveal plans for TV purchases over the next 12 months. This unique global study provides clients with country-level insights and information based on nationally representative samples of more than 14,000 TV owners. The study combines NPD DisplaySearch TV analyst expertise with the advanced consumer survey design of its parent company, The NPD Group. For more information on the NPD DisplaySearch Global TV Replacement Study, contact Charles Camaroto at 1.888.436.7673 or 1.516.625.2452, e-mail contact(at)displaysearch(dot)com, or contact your regional DisplaySearch office in China, Japan, Korea or Taiwan for more information. Since 1996, NPD DisplaySearch has been recognized as a leading global market research and consulting firm specializing in the display supply chain, as well as the emerging photovoltaic/solar cell industries. NPD DisplaySearch provides trend information, forecasts and analyses developed by a global team of experienced analysts with extensive industry knowledge and resources. In collaboration with The NPD Group, its parent company, NPD DisplaySearch uniquely offers a true end-to-end view of the display supply chain from materials and components to shipments of electronic devices with displays to sales of major consumer and commercial channels. For more information on NPD DisplaySearch analysts, reports and industry events, visit us at http://www.displaysearch.com. Read our blog at http://www.displaysearchblog.com and follow us on Twitter at @DisplaySearch. The NPD Group is the leading provider of reliable and comprehensive consumer and retail information for a wide range of industries. Today, more than 2,000 manufacturers, retailers, and service companies rely on NPD to help them drive critical business decisions at the global, national, and local market levels. NPD helps our clients to identify new business opportunities and guide product development, marketing, sales, merchandising, and other functions. Information is available for the following industry sectors: automotive, beauty, entertainment, fashion, food, home and office, sports, technology, toys, video games, and wireless. For more information, contact us, visit http://www.npd.com, or follow us on Twitter at twitter.com/npdgroup.